Redstone Websites run by Graeme and Kim specialise in building bespoke easy to use Web Content Management systems. If your business needs a new or modernised website or mobile app please get in touch. For EOSM club members, here's a little flying freebee from Redstone Websites - the EOSM Weather Stopwatch. 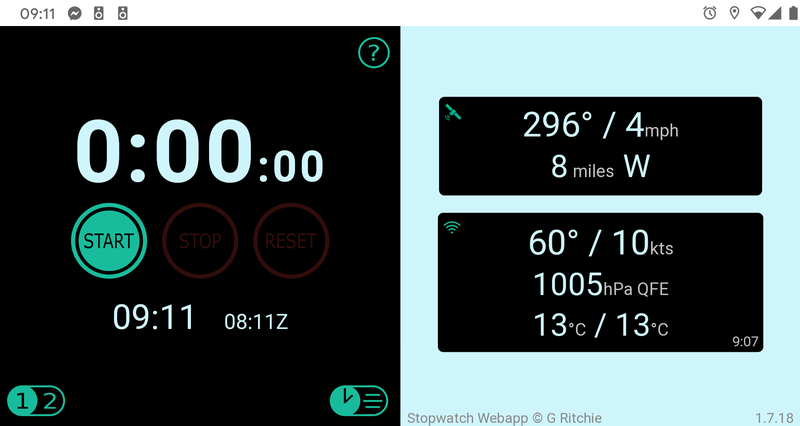 Get rid of that old-fashioned stopwatch stuck to your panel and use this app for free. Once installed, it'll work offline on any smartphone or tablet or even a laptop and will give you a stopwatch, a note of the local time and Zulu time, your track and groundspeed and your position relative to East Fortune (take the guesswork out of that inbound radio call!) and, while you have a network connection, a live feed from the EOSM weather station, updated once a minute. It will run happliy in landscape or portrait mode to suit your particular panel. It can also display crosswinds for th East Fortune runways and allow you to take or view notes in flight - radio frequencies when touring, for example. No need to visit the App Stores. To install the app on your phone/tablet simply point its browser at https://redstone-websites.com/stopwatch. Make sure you allow permission to location services when prompted. Add the page to your phone's homescreen so that it runs in fullscreen and behaves like an app. You'll need the phone's screen to "stay on" and not time out after a minute or so. On Android we recommend the free Screen On app, available at the Google Play Store. On iOS you'll need to adjust your display settings. Keeping the screen on in a cold environment will drain a phone battery quickly. It is strongly recommended to have your device connected to a power source when using the app. Discount - Ian is offering a 20% discount to club members who need heating and plumbing installation, breakdowns, servicing and maintenance. When you call him, please mention that you are a member of the club. Contact Ian Forrest on 0131 669 8108, mob. 0775 477 2206 or email forresti@blueyonder.co.uk Please tell me you're an EOSMC member when calling. Our 'big' band Absent Friends, is a 4 piece consisting of lead guitar/vocals, electric keyboards with split bass and vocals, fiddle/mandolin/whistle/electric guitar/vocals and drums/vocals with Scottish Ceilidh dance calling. We do a range of rock covers along with Irish, Scottish, country, pop, standards, ballroom and also ceilidh stuff. We've played all the major castles, hotels etc. around Central Scotland as well as appearing in Biddy Mulligan's Pub in the Grassmarket every Sunday and regularly in Finnegan's Wake in Edinburgh too. We've done Outdoor Ceilidhs in Three Sisters at Festival time in the Cowgate. Info. and samples of 'stuff' can be found on www.myspace.com/absentfriendsscotland. The 'wee band' Leonard Scunnered is as above but without the lead singer/guitarist. It tends to be mostly ceilidh music along with teaching the dances where required. Not deadly seriously, more to make the event good fun. Again, we've played most known places (and some obscure) including T in the Park Ceilidh Tent and St. Andrews Society Balls in Vietnam, Trinidad and Houston, Texas. I also teach ceilidh dancing to Edinburgh schools, even two in New Zealand. Robert Whitton can undertake research into your family tree. Contact him initially by email on crwhitton@googlemail.com and then discuss what your requirements are to agree a (discounted) price for EOSM members.